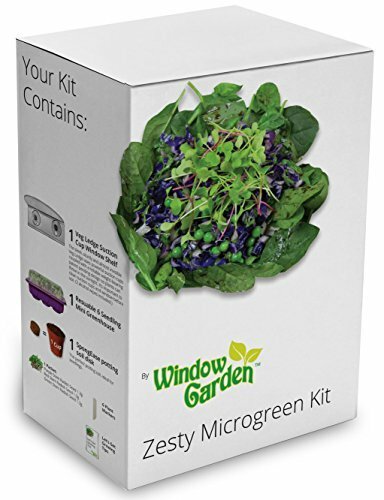 Window Garden Microgreens Kit for Growing Your Own Superfood. Includes the Popular Space Saving Veg Ledge Suction Cup Window Shelf and Mini Greenhouse. Super Easy, Seed Growing Gift for All Ages. MINI GREENHOUSE - High Quality and Reusable, Creates the Perfect Environment to Germinate Seed for your Microgreens crop. VEG LEDGE SUCTION CUP WINDOW SHELF - Maximize Sunlight, Minimize Windowsill Clutter - Securely Holds Over 5 Lbs. SPONGEASE PERFECT POTTING SOIL - Expand it with Water and Spread Seed Over It, the Excellent Water Holding Capacity and Porous Fibers are Perfect for Growing Microgreens. EVERYTHING YOU NEED - Grow Microgreens with our Microgreens Kit is Complete, Inexpensive and Rewarding for All Ages. NEED A SEED GROWING GIFT? For Christmas, Birthdays, Moms, Dads, Students, Friends - Impressive From the Packaging to the Detailed Instructions - Sure to WOW! Growing Microgreens is fun and highly nutritious. Great for all ages, get kids involved in growing superfood. This Microgreen kit has everything you need for successful Microgreens growing with easy to follow and informative instructions. No need to buy different products like seeds or messy growing medium, you don't even need a windowsill, just stick the handy Veg Ledge to a window for maximum sunlight and when your Microgreens are grown, just clip and eat them. The Veg Ledge suction cup window shelf saves space and maximizes vital sunshine plants need. The unique patent pending design distributes weight evenly on the lower support bar taking pressure off the suction cups. It's important that the window and suction cups are clean, enclosed are alcohol wipes for cleaning and detail instructions for years of reliable, dependable use. Microgreens are best eaten fresh and raw. Sprinkle away on salads, soups, sandwiches or smoothies. Microgreens are small but mighty and pack a potent punch of nutrients that contribute to good health. Outstanding value! The Veg Ledge and the mini greenhouse are high quality and durable so you can use them again and again. Highly effective Microgreens growing kit with premium packaging, graphics and instructions make this the perfect seed growing gift for Christmas, Birthdays, moms, dads, kids, friends, relatives and coworkers. Get growing with the many unique and clever Window Garden products.